This blogs will not appear on the Home page, but they will appear on Cathegories. If you are crimping a lot of RJ45 patch-cords and you always forget the wire sequence, here is a Simple method to remember the wire sequence and colors. I always use the same standard and by doing so I don’t have to check all the times what particular standard i used on a specific cable. 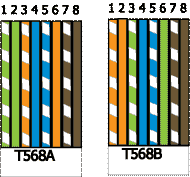 I use the T568B standard because there is a mnemonic to remember the wires order. The order of the wires always alternates striped color with solid color. Then the order of colors is RGBB, (the mnemonic uses red for the orange pair, and the colors are red, green, blue, brown.) The trick is to remember the the blue pair is always in the middle, (pins 4 and 5). The mnemonic works for me even though is a little forced.